One Fat Frog Restaurant Equipment is proud to say that we are the only used commercial restaurant equipment dealers in Florida who offer free delivery to nearly every city in Florida. Every day the One Fat Frog Restaurant Equipment delivery crew is making free deliveries to Orlando and the surrounding areas and once a week the One Fat Frog Restaurant Equipment delivery crew is going above and beyond and hitting up cities all over Florida – dropping of hi-quality refurbished restaurant equipment everywhere in between. One Fat Frog Restaurant Equipment delivers for free to Jacksonville, Gainesville, Ocala, Tampa, the Beaches areas, Heartland, Lakeland, and many more including historic St. Augustine – one of Florida’s major tourist destinations and a great place for a restaurant! The city is a popular tourist attraction, for its Spanish Colonial buildings as well as elite 19th century architecture. The city’s historic center is anchored by St. George Street, which is lined with historic homes from various periods. Most of these homes are reconstructions of buildings that had been burned or demolished over the years, though a few of them are original. The St. Augustine Alligator Farm, incorporated in 1908, is one of the oldest commercial tourist attractions in Florida, as is the Fountain of Youth, which dates from the same time period. 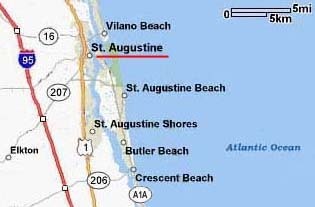 The city is one terminus of the Old Spanish Trail, a promotional effort of the 1920s linking St. Augustine to San Diego, California with 3,000 miles (4,800 km) of roadways.